特定非営利活動法人アスク > Welcome to ASK’s website! 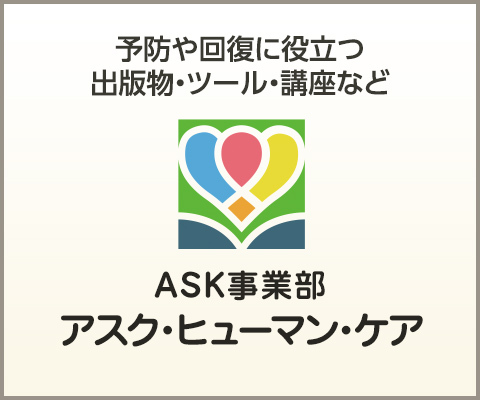 ASK stands for: Alcohol Yakubutu Mondai Zenkoku Shimin Kyokai, i.e. Japan Specified Non-profit Corporation to Prevent Alcohol and Drug Problems, and other addictions. Board: Akio Ando (journalist), Hisako Kimura (assertiveness trainer), Akira Hagiwara (editor), Rika Hieda(social worker), Yuichiro Yamamoto(lawyer). Memberships: about 300 members in all over Japan, including people specializing in medicine, health/welfare and education, recovering alcoholics, families and friends of alcoholics, students, journalists, etc..
Funding: Membership fees, contributions and grants. ASK Human Care Inc : established in March 1994 with ASK as the shareholder. ASK Human Care is engaged in publishing, seminars and consultation. If you can sympathize with us at all for our activities and ideals, please participate in activities through donation and membership registration. Research: Survey on drinking habits of junior and senior high school students (1988), survey on TV ads of alcoholic beverages (1990), survey on alcohol/tobacco vending machines that illegally occupy public roads (1990), survey on the damages caused by ikki (binge drinking) among youngsters (1992), survey on the medical/rehabilitation facilities for alcoholism in Japan (1994), survey on the medical/rehabilitation facilities for various addictions in Japan (1998, 2002), ,analysis of drunk driving cases (2007, 2008, 2011, 2013), etc. Publication: Quarterly Magazine “Be!” (formerly known as “Alcohol Syndrome”), other publications related preventing, intervening and treating alcoholism, etc. ASK is also focusing on Adult Children issues (children brought up in dysfunctional families as well as alcoholic families). Please note that all publications are available only in Japanese. Website: all-around information on alcohol and drug problems, and other addictions such as internet and gambling. Prevention Education for school children: Visiting schools with original panels to talk about alcohol and drug problems. Correspondence courses for helping professionals and the families of alcoholics, to understand alcoholism; the first of its kind in Japan (initiated in 1996) / Seminars are: Intervention, Family Program, Inner-child Work for Adult Children, Grief Work, Co-dependency, Assertiveness Training / Lectures & workshops by well-known professionals from abroad. Protest against advertisement to attract minors’ interests and promote excessive drinking (since 1984) / Protest against Alcoholic Vending Machines (since 1983 to 2000) *In 2000, liquor retailers’ unions set the self-restriction to abolish alcoholic vending machines but not yet completed / Request alcohol and drug education to be incorporated into health / physical education curriculums of the elementary and high-school (1986) / Protest against deregulation for acquisition of liquor selling licenses (1988) / Request correction to the publishing companies upon their medical textbooks, which include incorrect or inappropriate description on alcohol dependency (1998) / Protest the Japan Red Cross against their distribution of liquor to the refugees of flood in Kochi Prefecture (1998) / Protest against alcoholic beverage packages looking like soft drinks, requesting to set the self-restrictive code (since 2002) / Request to take intervention and prevention measures against drunk driving of the professional drivers (since 2003) / Request to post warnings against drinking during pregnancy (2004) * Brewer’s Association of Japan decided to post the warning such as “Drinking during pregnancy and breast feeding can cause ill effect to the development of fetus and baby” (2004) / collaborate with the multi-party parliamentary group to establish “The Basic Act on Measures against Alcohol-related Health Harm” (2012 to 2013) * unanimously approved (2013). These are 4 significant alcohol policies taken by the governments worldwide. In the past 20th century, Japanese government had been taking the policy 4. It was not known that Health Promotion would reduce the medical and social cost, and the economical development was always the prior. Also, drunkenness was acceptable in the Japanese culture, which encouraged the government to stay in the policy 4. It was 1985, when the Ministry of Health and Welfare first stated necessity of ‘the prevention of alcohol related problems’ that caused friction between the Ministry of Finance. In 1991, the World Health Organization’s congress on alcohol related problems was held in Tokyo, which enforced the Japanese government to step towards the policy 3, as BAN of vending machines was declared in ‘the Recommendation’. Cooperating with the consumer’s movement and the professionals we’ve been trying hard to promote the awareness in the society by research, social action and campaign. “The Global Strategy to Reduce Harmful Use of Alcohol” which was resolved by the WHO in May 2010 strongly recommends that member States take leadership, build government policies and work together with both governmental authorities and non-governmental agencies and facilities in the related fields. In order to promote the Global Strategy into action in Japan, AL-HOU-NET was established in May 2012. It consists of medical societies, professional associations, NPOs including ASK, self-help groups and other interest groups. Collaborating with AL-HOU-NET, the multi-party parliamentary group in the National Diet made a great effort to draft “The Basic Act on Measures against Alcohol-related Health Harm”. The bill had been finally introduced to the Diet on November 20 and passed on December 7, 2013. It was the unanimous approval both in the House of Representatives and the House of Councilors. The Act was enforced in June 2014 and the government devised the basic plan in May 2016. 47 prefectures are expected to devise their action plans by 2020.